Advertising and transportation industry has to follow the latest technology to satisfy the users. The industry has to compatible with the digital technology such as smartphone devices. 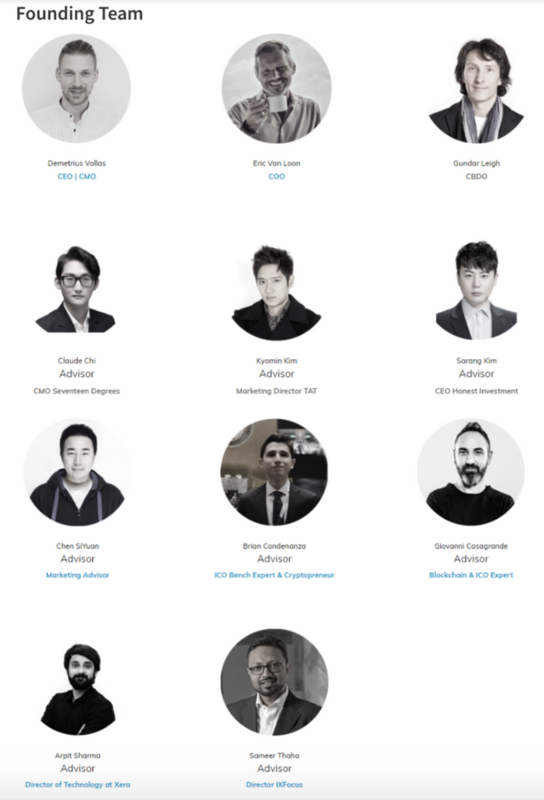 Tachain is a platform which wants to accommodate advertising and transportation industry and the latest digital technology, blockchain, and cryptocurrency. The platform helps to do any kind of activities related to advertising and transportation easier by only using your mobile phone devices. The users such as the travel agent, advertising agent, driver, and customer get more benefits from the platform including TCHN tokens. The idea is to give easiness and also more benefits for those who want to use cryptocurrency and blockchain technology. Tachain is a platform designed to support transportation and advertising industry. The platform covers three different businesses, which are transportation application, advertising platform, and token exchange marketplace. The platform helps to target the customers by making a synergy between the advertising and transportation. For instance, people are able to watch your ads while using taxi, buses, or any kind of public transportation. Moreover, the users are able to call the public transportation they need and pay the cost by using a smartphone and cryptocurrency. The interesting part, it is not only the customers who can rate the agencies but the agencies can also rate their customers. Tachain wants to be a solution and connection between travel and travel agencies and the customers. The platform is also trying to give something valuable to the users including TCHN tokens for what they have done and watched. By using the platform it hopes that the users can find anything they need such as the best route, the best transportation device, interesting ads they need, and many more through their mobile devices and application. 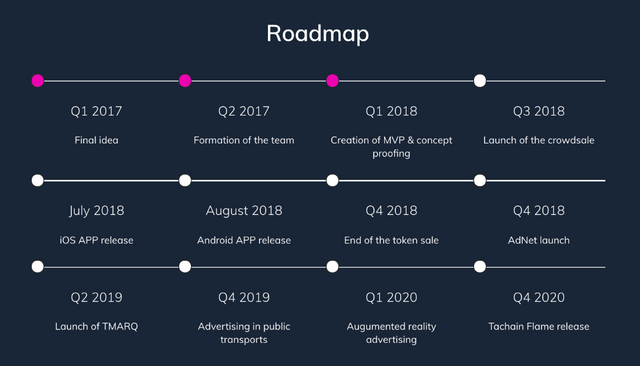 In the future, Tachain wants to be a high-tech platform along with Augmented Reality and a specific system which gives a chance for the users to earn some tokens after watching targeted ads anywhere and anytime. Tachain is developed for those who are involved in the transportation and advertising industry. For transportation agents, they can improve their vehicle and system which can attract more customers to use their services. For advertising agents, they are able to increase their income and value because the ads can be seen anywhere they want. It grabs more reputable customers. For the customers, the platform is a good option to deal with transportation and advertising easier. You can order your favorite public transportation and pay the cost via smartphone. You can also watch the ads you want to see. Interestingly, all of them get a reward in the form of TCHN tokens. There are three platforms used to develop Tachain. The first component is transportal and it is a valuable component for manage everything related to the transportation and accommodation effectively. The second component is Adnet which support advertisers to get their targeted audiences for more income and value. The third component is TMARQ which acts as a token exchange market so the users can manage their cryptocurrency asset better. They can exchange their token into different cryptocurrencies easily without using any other platform. 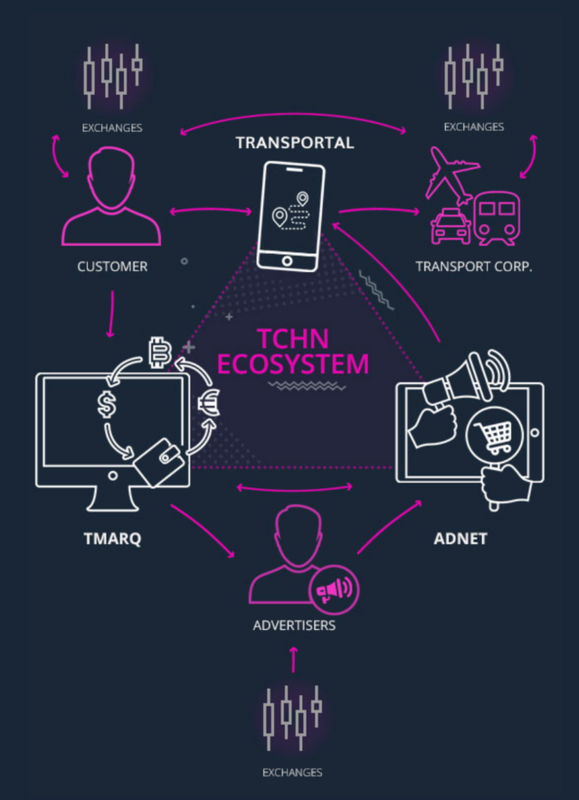 By using those components, Tachain becomes all in once platform for travel and advertising industry. To support the platform, Tachain is using TCHN tokens. 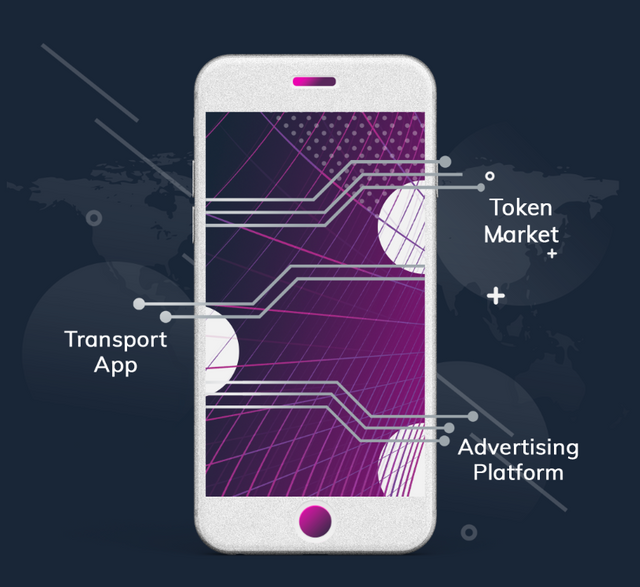 The tokens can be used for any kind of activities such as traveling, accessing advertising platform, searching for targeted customers, paying the transportation and advertising cost, and many more. The users have an opportunity to earn TCHN tokens when they do something as a reward. Over 2.275.000.000 tokens were released for the customers, investors, and development. The price of the token is $0.01 per token and it will be released from July 2018 to October 2018. So far, the users are able to exchange the token with ETH and BTC but in the future TCHN tokens can be exchanged with all types of cryptocurrencies.